This wall sculpture is called “Bumps and Wiggles.” It is one of my early overlay projects and is a culmination of many shop experiments. Its dimensions are about 29×14 inches. 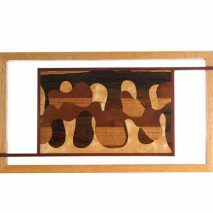 The outer frame is built from Oak and Purpleheart, the body of the piece is comprised of several woods including; Zirocote, Maple, Mohagony, Blackwood and Bocote.